The word “laser” consists of the words Light Amplification by Stimulated Emission of Radiation. A laser device produces coherent light, where the wavelengths are equal, vibrate parallel and with same frequency. The first laser was invented in the USA in 1960. 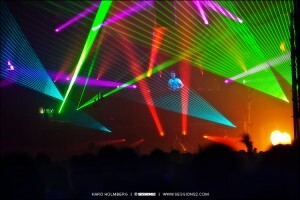 Nowadays typical applications of lasers include the reading of CD/DVD discs and bar codes. In health care, the therapeutic laser has been used for a long time especially in Eastern Europe and Asia. Therapeutic laser (also known as “soft” or “type III” laser) differs from the more powerful laser which is used in surgeries. 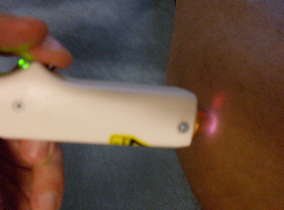 In physiotherapy, lasers are used e.g. to ease pain and to heal soft tissue injuries. Laser treatment is carried out by using a pen electrode which is applied on bare skin. Typically 15-120 second treatment time is applied on 5-8 areas. The desired amount of energy is set (often 0.5-3 Joules) and the device calculates the treatment time automatically. For example in acute soft tissue injury, the laser treatment is put into practice daily. After the inflammation phase, the treatment frequency is lowered to e.g. 1-2 times a week. The treatment rarely causes any sensations, but sometimes a small tingling. Trigger points are localized and treated. When localizing the trigger points, the patient holds an electrode in their hand and the pen electrode works as the other electrode. The laser device indicates the electric resistance with a crackling voice. At these points, more nerves are present compared to the surroundings. Laser treatment is a safe treatment method. The skin absorbs most (80 %) of the laser light, so no harmful effects are caused on e.g. internal organs. Class III lasers don’t produce heat. Contra indications are rare and the biggest safety risks are related to eyes. 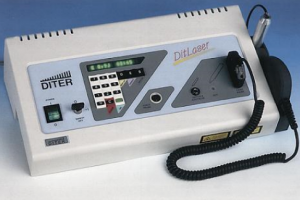 In the Diter laser device, the laser light is automatically interrupted if the distance from the skin becomes too big. This prevents the laser from being pointed in the eyes by mistake. Additionally, the light is on only when the button in the laser pen is pressed (after the laser pen is first set against the skin).